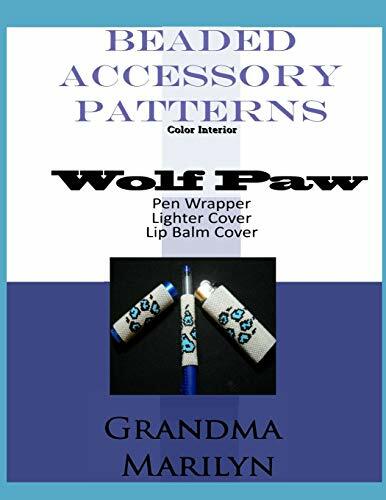 If you are into Native American type bead-work, you will love this Wolf Paw Accessory Set. The book consists of bead patterns for a pen wrap, lip balm cover, and lighter cover for a big Bic lighter. All of the patterns consist of a wolf paw in opaque light blue with black outlines on a white background. The sets have been tested and you will see images of the finished pen wrap, lip balm cover and lighter cover. The front cover shows the whole set together.These wonderful bead patterns were designed to be beaded in either even count peyote or brick stitch with 3 colors of Delicas. All you do is bead them up as a flat piece, zip it up, and slide it on your pen or secret compartment. Easy as can be. I have always been interested in anything Native American. When I saw a public domain image of a wolf paw, I thought "Wow! That would be great on one of my accessory sets." I set down at my laptop desk and proceeded to work on designing a pen wrap bead pattern with a wolf paw. I showed it to my daughter to see what she thought. She said she liked it. So I proceeded to make a pattern for the big lighter cover and lip balm cover. I sold these in my online shops both individually and in an e-book with all 3 bead patterns. Then one day someone suggested that I publish this book. I fell in love with beading way back in the 1980s. My Mother-In-Law (MIL) had dolls and other crafts that she wanted to sell. I suggested that we go to craft show. I learned to make soft sculpture dolls that looked like real babies. Then I started thinking of what other crafts I wanted to take up so that I could sell them at the craft shows. I found some books on beading earrings and so began my love of beading. My beading was put away while I went on to other crafts. But, in 2005, my love of beading came back again. My new MIL and I started a business together. She was selling collectibles. I decided to start beading again to sell my finished beaded items. This time, I was hooked. I became addicted to beading other designer's bead patterns. Eventually, I started designing bead patterns for me to bead. I was convinced that I should put them up for sale so that other beaders could enjoy them, too. I have been selling my bead patterns online since May 2009. Grandma Marilyn has been a crafter ever since she can remember. She started out with crocheting and other crafts. Late in 2005, she discovered beading. Grandma Marilyn started small making some ornaments and easy beading. She needed to have to have a pattern or she could not bead. Of course, all of her crafting had been that way ever since she could remember. She used to say that she did not have a creative bone in her body. With some encouragement from other beaders, she started doing harder and harder beading created by other bead designers. Her beaded jewelry can be found in Grandma Marilyn's eCrater shop. Grandma Marilyn found some beading software and started playing with it coming up with some patterns that she beaded up and put up for sale. Glenda Payseno and Marie Starr started working on her self-esteem and convinced her to create some beading patterns and put them up for sale. Well, She can be proud of her accomplishments as a bead pattern designer as her bead patterns are now for sale in several shops online, as well as Amazon and CreateSpace. Because she was shown the way by other bead pattern designers, you can share in the beautiful bead patterns she has created.